Despite the fact that they may be a little more efficient, refrigerators can be a substantial part of your energy bill each month. There are a few ways you can keep the costs down. Little do people usually realize that the refrigerator is an energy hog that typically eats up 10 to 25% of the average households power bill. When going on extended vacation (week or longer) take out all perishable items and pitch them. Then turn the cooler adjustment down all the way to the lowest setting. There may be some items that can be placed in the freezer rather than throwing away. Keep the refrigerator compartment at 37 to 40 degrees Fahrenheit and the freezer compartment at between 0 – 5 degrees. Periodically clean (brush) the refrigerator coils on the back or bottom of the refrigerator. This can also help extend the life of the refrigerator and help it to operate more efficiently. If enclosing the refrigerator in a tight space, try a ventilation fan out the back. A tight enclosure can cause inefficient operation. Aluminum foil helps keep foods colder and better conditioned. Paper prevents cooling. Allow plenty of air flow around the refrigerator. Give the fridge as much breathing room as possible but at least 2 inches on all sides. 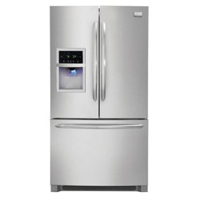 Top freezer refrigerators use less energy for comparable storage capacity than side by side refrigerators. Although Energy Star rating is not perfect its about the best indicator we have for knowing that there is some efficiency standard contained for any particular unit. Keep the air flow inside the fridge free of encumbrances. Do not pack foods in too tight. Give the doors a dollar bill test. Put a dollar bill between the door insulation and the fridge in the closed position and pull it out. If it pulls out without any resistance, you may not have a good seal and may need to replace the insulation or tighten some adjustments on the door hinges. When purchasing a refrigerator buy the storage capacity you need and not more. The more space you have to refrigerate, the higher the energy cost.